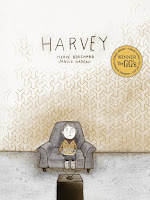 Young Harvey and his brother come home after playing with the other neighborhood children to learn that their father has suffered a fatal heart attack. Harvey compares his situation to the fate of Scott Carey, the hero from his favorite film, The Incredible Shrinking Man, who begins shrinking in size after his exposure to a shower of mysterious sparkling dust. During his father’s funeral, Harvey becomes invisible. The art, with its pencil and pastel drawings, is like the story: surreal and simplistic. Most libraries seem to place this book in their juvenile section, and although the story seems to seethe with an undercurrent of psychological meaning, and to be infused with the haunting weight of grief, this reviewer doubts that American children will be able to make much sense of it. Recommended for Gr 7 Up, or for those who appreciate surrealism.